Occasionally a good concept gets lost in the execution. Take this recent e-mail from Symantec as an example. No-one wants to be pitched on replacing their current IT security infrastructure. But a free opportunity to learn its potential vulnerabilities? Sounds attractive. However, from there it’s all downhill. 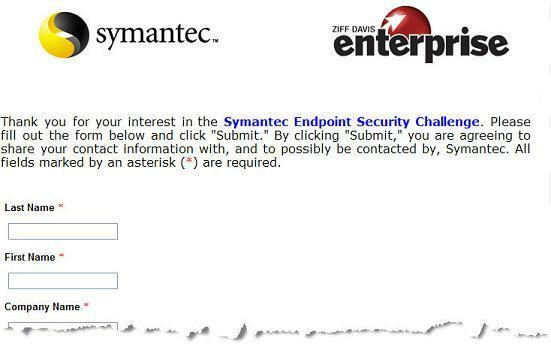 What Symantec fails to do is to effectively sell, or even describe, the offer. How long does the challenge take? What will I be asked to do? Do I have to install anything? What data will I receive as a result of taking the challenge? How will I receive that data (in a report, for example)? Hoo boy. Sign me up. This entry was posted in Creative, E-mail, Landing Pages, Offer Strategy on January 4, 2008 by Howard Sewell.